"As Christians we are particularly concerned to gain a deeper understanding of how people throughout the world—all created in the image of God—can deal with their responsibilities for, and their distrust of, one another. Rejecting all utopian illusions about the triumph of human goodness, contradicted as those illusions are by human selfishness, crimes, and hatreds, we also refuse to ignore the constant evidence of God's mercy and grace toward humans throughout all generations, a sustain mercy and restraining grace that make possible forgiveness, renewal, cooperation, and the continuing search for ways to resolve conflict and to build patterns and institutions of greater justice and stability." Perhaps globalization, even more than postmodernity, is the dominant spirit of our times. This makes it one of the greatest challenges facing the twenty-first century. It is therefore essential that the Christian community, among others, grapple seriously with this reality. 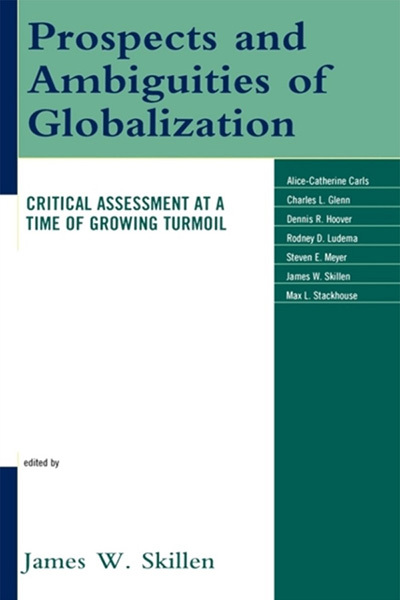 There are few more trustworthy guides through the tangled thicket of globalization than Jim Skillen. He has gathered together a fine group of scholars to address this issue from various disciplinary standpoints, offering an insightful opening and conclusion that bind them all together.